Ivan Edwards Hinshaw5,6,7 [Ivan Edward Hinshaw1]. CHINA GROVE - Ivan Edwards Hinshaw, 84, passed away Friday evening, July 8, 2011, at his residence following a period of declining health. Born April 2, 1927, in Alamance County, he was a son of the late William David and Lola Andrews Hinshaw. 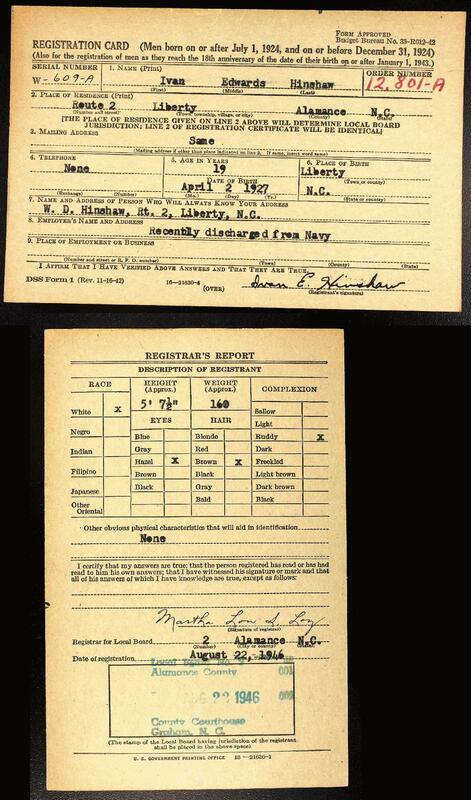 A graduate of Liberty High and Burlington Business College, he had honorably served his country during the duration of WWII with the US Navy. Mr. Hinshaw retired after more than 25 years of service with Collins and Aikman and loved his family and golf. In addition to his parents, he was preceded in death by a brother, Bernard Hinshaw. Family members include his wife of 63 years, Millie Fogleman Hinshaw; his sons, Ed Hinshaw and wife Anna of Salisbury, Steve Hinshaw of China Grove, Keith Hinshaw and wife Wendy of Badin, and Larry Hinshaw of Orlando, Fl. ; brothers, William Hinshaw of Harrisonburg, Va., Robert Hinshaw of Cary; sisters, Edith Moore of Asheboro, Myra Way of Alamance; five grandchildren; and four great-grandchildren. Visitation and Services: The family will receive friends Tuesday, July 12, from 1:30 to 3 p.m. with the service also at 3 p.m. at Prince of Peace Lutheran Church conducted by Pastor Ray Sipe. Burial will follow in the church cemetery. Memorials: Memorials may be made to Prince of Peace Lutheran Church, 3070 E. Hwy. 152, Salisbury NC 28146. Linn-Honeycutt Funeral Home in China Grove is serving the Hinshaw family. Online condolences may be made at www.linnhoneycuttfuneralhome.com. CHINA GROVE - Mrs. Millie Fogleman Hinshaw, 84, of China Grove, passed away on Monday, Nov. 4, 2013 at Carolinas Medical Center-Northeast. Born Feb. 26, 1929 in Alamance County, she was the daughter of the late George and Abby O'Brien Fogleman. 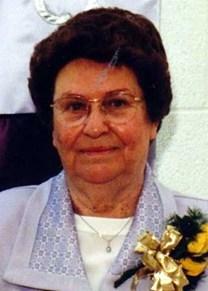 Mrs. Hinshaw graduated from Williams High School in Burlington and was a longtime member of Prince of Peace Lutheran Church, where she was a children's Sunday school teacher. Professionally, she worked in Stanly County government where she was a deputy Clerk of Court. Mrs Hinshaw loved sewing, crocheting, working puzzles and watching soap operas. She particularly loved her family and they were very important to her. In addition to her parents, she was preceded in death by her husband, Ivan Edward Hinshaw, who passed away on July 8, 2011. Those left to cherish her memory are her children, Ed Hinshaw (Ana) of Salisbury, Steve Hinshaw of China Grove, Keith Hinshaw (Wendy) of Richfield and Larry Hinshaw of Orlando, Fla.; sister, Bessie Wagner of Burlington; grandchildren, Toni Lovett, Rachel Smith, Alan Hinshaw, Amy Hinshaw and Chris Hinshaw; and great-grandchildren, Karen, Emily, Jessica and Samantha Lovett. Visitation & Services:Visitation will be 2-3 p.m. Thursday, Nov. 7, 2013 at Prince of Peace Lutheran Church with funeral following at 3 p.m., also at the church with Rev. Kay Overcash, minister. Burial will follow at the church cemetery. Contribution from Toni Lynne Hinshaw. Obituary of Millie Jean Fogleman. Obituary of Ivan Edwards Hinshaw. William David Hinshaw's family bible.